Slow cooker Moo Shoo Pork is a quick meal to get prepared to cook in the slow cooker. Once the ingredients are in the slow cooker, go about your day and in 8 hours a delicious meal is ready. 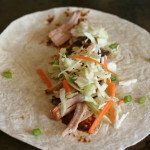 Shred the pork and serve this in tortillas with Asian slaw or over a bed of brown rice. A low-calorie meal that will satisfy the whole family! For the Hoisin Sauce -in a small bow, combine the gluten-free soy sauce, creamy peanut butter, honey, rice wine vinegar, sesame oil, Asian hot sauce. In a 4-6 quart slow cooker, add the pork and hoisin sauce, minced garlic, sliced green onion, and ginger. Toss the pork pieces in the sauce and spices to full cover. Cover and cook on low 8-9 hours, or until the pork can shred easily with a fork. In a large bowl, combine the coleslaw, vinegar, and sugar. ( Feel free to quickly stir-fry the slaw in a skillet, using medium heat, to blend flavors. Shred the pork with a fork. Serve in tortillas with some of the Asian slaw and Hoisin Sauce. Another option is over a bed of either white or brown rice. Garnish with sliced green onion.